Ultra soft and resistant disposable pillow case: the cotton effect but disposable. 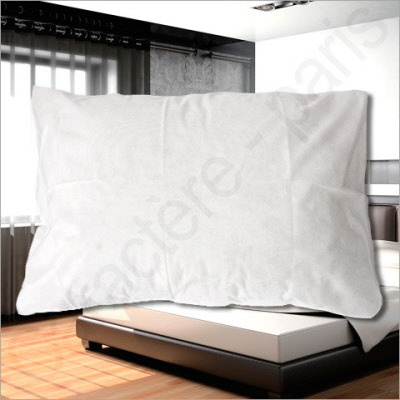 Super soft pillow case in material called Absorbtex made for the upper class hotel or B&B. The material is smooth as the coton and durable but not washable. As every pillow case it has to be changed for every guest but can stay several days. This pillow case is BIODEGRADABLE. It uses vegetal material but it's still cheaper than cotton fabric. But much more ecofriendly because you don't need to wash it. It's a non waterproof pillow case but give softness needed for a good sleep. Size: 63 x 63 x 13 cm (euro square) to fit a 60 x 60 pillow or 50 x 75 x 15 cm (oxford size). all the pillow case are made with a easy closing fence.